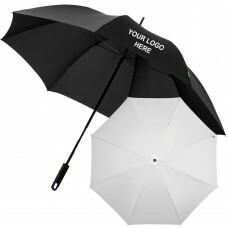 We supply umbrellas direct to you, with your desired logo or image expertly printed onto the nylon panel. Large umbrellas originally designed to shield golfers and their carts from the weather, golf umbrellas are now popular city items for those seeking extra protection from the elements. Slickly designed and perfect for corporate recipients, golf umbrellas boast massive branding spaces for your logo to be visible even from far away. 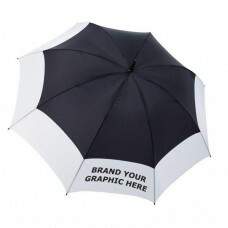 The advantage of using umbrellas in your campaign is that they are high use items – nobody throws away a working umbrella. This ensures your brand exposure is ongoing and without single event restrictions. We print your logo directly onto the panels of these quality umbrellas and ensure they're delivered directly to your sporting event, marketing expo, or business headquarters. Golf umbrellas, in particular, exude professional style and are popular gifts among corporates and small businesses alike. Our umbrellas feature quality construction and nylon canopies which feature an acrylic coating on the underside to make sure that water never goes through the fabric. On the top of the nylon, we use Scotch Guard to ensure further that water is repelled keeping you dry all year long nd make cleaning a breeze. We know in the Australian climate you will need your umbrellas quickly to shield out either the sun or the rain. That's why we offer a speedy two-week turnaround on all bulk golf umbrella orders. Need a product faster? Just ask our sales team for more information. If you have a corporate sports day, promotional golf day or even just a team building exercise, our golf umbrellas are a great option for gifting to your team. 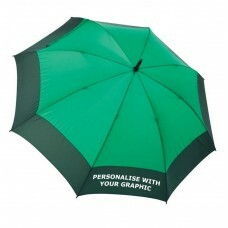 We have a huge assortment of umbrellas in colours to suit corporate groups and sports clubs alike. Grab golf umbrellas with a mix of white and navy | maroon | black panels - we'll print your team emblem or business logo on the white panels in vibrant colour. Umbrellas are the perfect gift for those who enjoy their outdoor activities and want to promote their business and sporting activities as well. Golf umbrellas give you great coverage in the rain with their expansive canopies, but what happens if you're caught in some serious wind while holding one? 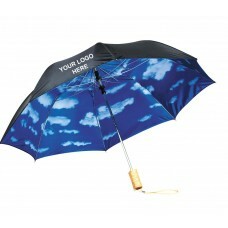 Umbrella Planet carries a large range of vented golf umbrellas and these are the perfect solution to the wind factor. Our vent technology allows wind to flow through the canopy of our select golf umbrellas so additional strain is not put on the stem or even your arm. Vents also help to prevent umbrellas from turning inside out during extreme weather. 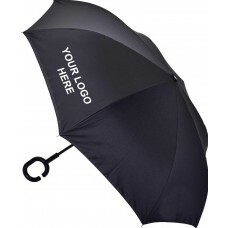 You get the latest and greatest golf umbrella technology when you purchase promotional units through Umbrella Planet. 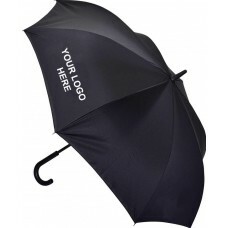 Our logo emblazoned golf umbrellas can be delivered direct to your business, home or event location Australia wide. Whether you're in WA, NT, SA, QLD, NSW, VIC, TAS we will deliver to you. Your bulk order will be sent from our factory on the East Coast to wherever you are in the nation. We only utilise quality, professional courier services so you can be sure your goods will be delivered on time and in excellent condition. Ask about our discount freight rates for large bulk event orders today! There's nothing more precious to a golfer than his or her swing, that's why Umbrella Planet's variety of golfing umbrellas feature handles that promote a comfortable, cramp-free hold. Whether you prefer a soft rubber grip that repels water or a budget friendly foam option, we can help you pick an umbrella with a handle that suits the needs of your recipients.